"They look exactly like us"
A still from Jordan Peele's newest movie, "Us." The movie trailer for "Us" brought two and a half minutes of horror on Christmas Day. Academy Award winner Jordan Peele's second directorial effort is receiving a lot of buzz on social media. The film suggests "we are our own worst enemy" and is described as a "new nightmare" on its website. The trailer opens with a family cruising in a Mercedes to the beach while the song "I Got Five On It" by hip-hop group Luniz is playing in the car. The mom, played by Lupita Nyong'o, tells her son while he's sitting on his bed, "Stick with me and I'll keep you safe." 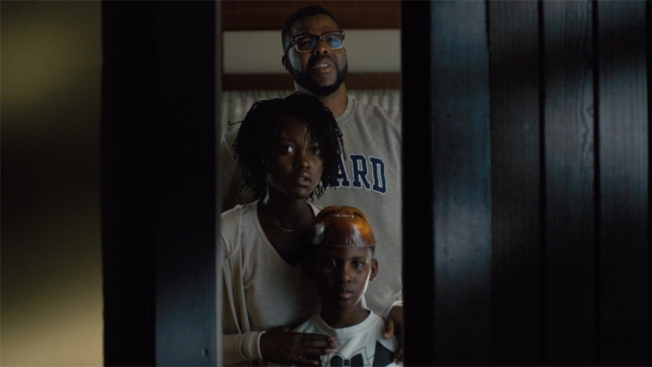 The father (Winston Duke of "Black Panther") confronts a family of four standing unrecognizable from a distance in dark shadows in the driveway. Later, a boy is seen wearing a white mask and the sound of a pair of gold scissors can be heard. Nyongo's character whispers: "They look exactly like us." Within 24 hours, the "Us" trailer was viewed 4.7 million times on YouTube and 6.3 million times on Twitter. "Us" will open in theaters on March 15 and is distributed by Universal Pictures. Peele's directorial debut, "Get Out," broke box office records with its $250 million worldwide haul, according to Box Office Mojo. The satirical horror film was made on a $4.5 million budget. I'm so gassed over this trailer for #UsMovie. I love horror films and this one looks super interesting. I love that they didn't reveal too much. LOVE what they did with the music. Ugh, I'm going opening weekend.